On this adventurous expedition to Mount Victoria in remote Chin state, you’ll travel into some of Burma's remote and least-developed areas, meet one of the most isolated cultures in the world and enjoy some wonderful hikes. The Chin mountain tribes still live traditional lives. You’ll see some of the older women still adorned in taboo facial tattoos, visit bustling markets and hike to the summit of Mount Victoria, the highest mountain in Chin state, rising 3053 meters above sea level. Now protected by Nat Ma Taung National Park, Mount Victoria looms above a vast and pristine jungle filled with natural beauty, stunning waterfalls and majestic mountain vistas. Be prepared for an adventurous journey visiting remote hill tribes, exploring the subtropical flora and fauna and some great hiking with spectacular scenery. Explore and photograph traditional villages, ethnic minority groups, colorful markets and stunning scenery. Wonderful hikes and 4x4 vehicle rides through undeveloped and isolated Chin state. Learn about traditional tattoo customs of the Chin Tribes. Visit the beautiful mountain town of Kanpetlet and Mindat. Reach the summit of Mount Victoria, the highest peak in the state and enjoy the sweeping views. Our trips are designed for small groups which maximises our experience and the flexibility we have on the trip but it does also mean our trip fill quickly. Contact us and let us know if you'd like us to hold a space for you with an Advanced Booking of $500, fully transferable until we announce the expedition. Inform one of our friendly Wild Earth Team members of your interest in holding a space with an Advanced Booking or Enquire about the trips details. Join us on an expedition to one of the most fascinating and intriguing countries of South East Asia, a land where thousands of ancient stupas rise out of flat plains and floating village life ebbs and flows on Inle Lake. Explore the “Forbidden Islands” from the comforts of a luxury sailing vessel. Home to the Moken sea gypsies, these islands were off-limits to foreigners until just recently. Imagine hundreds of uninhabited tropical islands with white-sand beaches, covered in dense jungle. 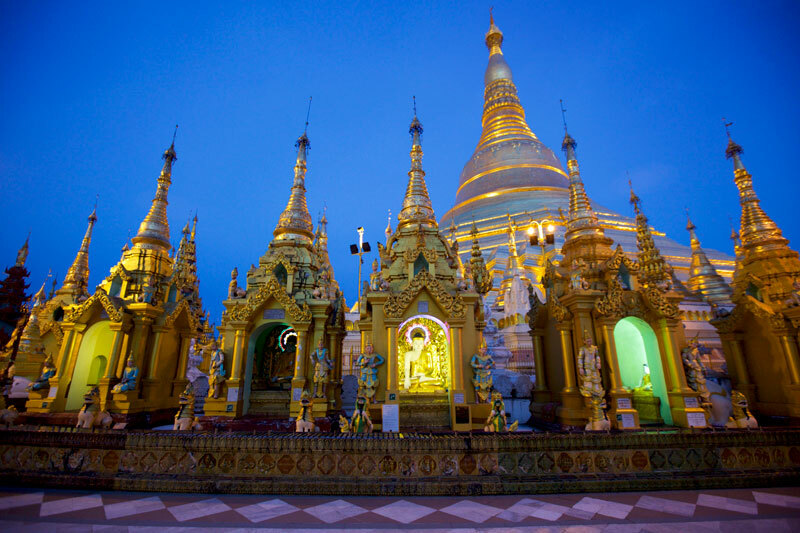 In this deeply Buddhist country, visit ancient temples, monasteries and pagodas; explore bustling colorful markets and immerse yourself in the cultural splendors of this magical place. Our Burma itinerary is designed to not only cover the classic architectural wonders in Yangon, Mandalay and the ancient city of Bagan, but to sail the spectacular Mergui islands from the comforts of a private yacht, to witness minority hill tribes and experience the timeless beauty of life along the banks of the Irrawaddy River from the comforts of a restored colonial riverboat. As the sun slowly rises behind distant mountains, float over Bagan's ancient pagodas, stupas and the mighty Ayeyarwaddy River in a Hot-air Balloon. Visit a remote elephant camp in a conservation area and help feed and bathe these gentle giants. Explore lush farmland, discover traditional villages and meet the ethnic minority tribes on a classic trek between Kalaw and Inle Lake and overnight at a monastery. The Mergui island boat charter company was awarded by NatGeo as one of the best trips for 2015. This amazing adventure has been designed to include incredible photographic opportunities.